The SCIO (Scientific Consciousness Interface Operation) system is a successful piece of the discoveries of natural sciences. Why? The SCIO provides an accurate and precise picture of our overall health and every treatment executed by it is personalized and unique – all this is backed up by thousands of satisfied clients around the world. When we are suffering from a physical or mental problem, we are looking for a method that can help us. Why not to try the SCIO system? Today the SCIO system is a worldwide known analytical and therapeutic device. Setting up the circumstances for our own being to connect to our next level of awareness and healing!. The SCIO Quantum Physics machine is a biofeedback device designed to detect and balance subtle charges of stress in the body. SCIO scans the client’s body like a virus-scan on a computer, looking for everything starting from allergies, toxins, weaknesses, viruses, and deficiencies to food sensitivities, stress or trauma. The SCIO has the ability to improve not only physical health, but also enhance our emotional, intellectual and spiritual wellbeing. It can also be used on pets. This safe, non-invasive device has been used in America, China and the rest of the world for the past 20 years with great success and is registered with the Health Professions Council as a Stress Reduction Device. Even though this process takes place over a period of time and is not a once off ‘cure’, the results are astounding. What can you expect from a therapy session? During and after SCIO sessions, clients can experience different sensations. They can feel energized, sometimes very relaxed and even emotional. A process of adjustment has been initiated where old, dysfunctional energetic patterns are released and new, functional and healthy energetic circuits are formed right inside the consciousness of their cells! Some clients find that their symptoms temporarily heighten, as these symptoms are brought to the surface and then gradually start to improve and dissipate. If you do experience some detoxification, try to drink several glasses of water per day. Water is a universal cleanser and will help the body to ease through the process of adjustment as well as eliminate toxins. Walking or any other form of gentle exercise that you enjoy is recommended. Lots of fresh air and deep breathing also helps the process of re-adjustment, as well as herbal teas and fresh juice. Paying attention to the thoughts and ideas that pop into your mind can be great indications of the issues that your sub-conscious mind is trying to resolve and clients have reported suddenly remembering traumatic childhood events long forgotten, with great clarity after a SCIO session. Novac Djokovic “Victory in Australian Open” and how his career changed since having regular S.C.I.O treatments. A feedback report is given after each session which includes information about the processes followed, before and after readings of vital health indicators such as resistance (immune system function), hydration, oxygenation and ph-balance of the body as well as a before and after pictures of the aura scan (as illustrated above). The report is explained by the SCIO operator and can be used to track the healing process. Remember that healing is a process that occurs on all levels of awareness: physical as well as emotional, psychological, and spiritual. The most important part of this process is your willingness to participate in the adjustment of your current state of being in order to unlock your deepest potential for lasting health and wellbeing. The SCIO operates within the theories of quantum physics. When the SCIO scans the body, a total of 92,000 areas are scanned in a matter of minutes. The basis of the SCIO technology is the transmission of 65 million tiny electro-magnetic signals into the body, many times per second. These pulses map the body and its organs and reveal abnormalities. The machine reports a mathematical model based on the voltage, amperage and resistance of the body. The SCIO reports on the biological reactivity and resistance in your body and indicates needs, dysfunctions and vulnerabilities. The information provided is fundamentally different from that provided by X-rays, blood tests and CAT scans, because it tells us about the energetic state of a body and the direction in which your body is focusing its energy. Once the SCIO has measured vitamin levels, amino acids, nutrients, food substances, minerals, enzymes, natural sugars, toxins, hormone levels, muscle tone, diseases, bacteria, modes, fungi, viruses and the health and balance states of internal organs, it compares the figures against the “norm”. After measuring the body’s frequencies, the SCIO feeds back frequencies to redress or neutralize destructive wave patterns. In some cases, it may add frequencies and in others release blockages, depending on the course of action most needed to restore balance. The SCIO has been devised using the principles of quantum physics. 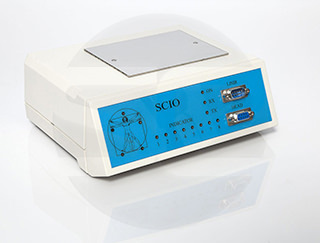 During therapy, the SCIO measures the body’s resonance/reactivity pattern and determines the change that occurred in the time period since the previous measurements (less than a second earlier). If there has not been an improvement, the input resonance of the frequency that the SCIO emits is altered. It maintains each beneficial setting as long as it is helping, and changes it as required.